In his address, the pope recalled with gratitude "the unexpected eruption" following Vatican Council II of the "new lay realities that, in various and surprising forms, brought vitality, faith, and hope back to the entire Church". Thanks to these, membership in the Church came to be viewed as a value, and not as a burden, reawakening "a vigorous missionary impulse, moved by the desire to communicate to all the precious experience of the encounter with Christ, understood and lived as the only adequate response to the profound thirst for truth and happiness in the human heart". In order to incorporate the novelty of these experiences within the fabric of the Church, there has been no lack of "numerous initiatives of reminder and orientation on the part of the pontiffs, who have begun an ever deeper dialogue and collaboration at the level of many particular Churches". In this way, "many forms of prejudice, resistance, and attention have been overcome". But now there is the need for a "more mature communion of all the ecclesial components, so that all the charisms, in respect of their uniqueness, may completely and freely contribute to the building up of the one Body of Christ". Beginning with the theme of the seminar that has just concluded - a phrase that the pope had addressed to the German bishops in 2006, "Approach the movements with great love" - the pope exhorted the bishops to "approach with great love the movements and new communities . . . in order to gain an adequate understanding of their reality, without superficial impressions or reductionist judgments". A number of times, the pope repeated that "the ecclesial movements and the new communities are not a problem or an extra risk, added to our already weighty responsibilities. No! They are a gift from the Lord, a precious resource to enrich with their charism as the entire Christian community . . . Difficulties or misunderstandings on particular issues do not bring the right of isolation". What might be feared is a journey along parallel lines, each for himself, the bishops on one side, the movements on the other. This would mean an impoverishing of both. 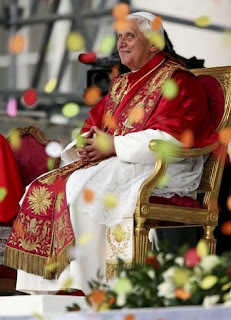 Thus Benedict XVI exhorts the pastors to "a service of discernment" and to "correction" of the values of the movements, and at the same time to resist "the temptation of making uniform what the Holy Spirit wants to be multiform, to contribute to the building and growth of the one Body of Christ, which the Spirit himself makes firm in unity". The pope recalls that the movements, "proud of their freedom and of their fidelity to their charism", have already demonstrated in the past that "fidelity and freedom are assured, and certainly not limited, by ecclesial communion, of which the bishops, united with the successor of Peter, are ministers, custodians, and guides". 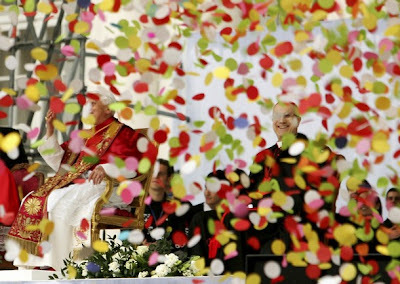 SVILUPPO: So now we know -- if you really want to make him smile, bring confetti... and the Pope'll enjoy it as well. Joined by a crowd of young people for today's Angelus in Genoa, B16 broke from custom to lead the Marian prayer in Italian (in lieu of the usual Latin). Ergo, for the day, it became the Angelo. 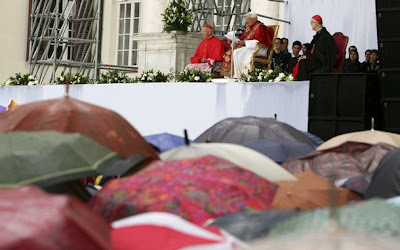 The pope, expressing his solidarity with them, recalled that rain is a gift from God "for the fecundity of the earth", and a symbol of the fecundity of the Spirit for "the desert places of the soul". The pope had begun the day with a visit to the shrine of the Virgin of the Guard [the Madonna della Guardia], located in the mountains overlooking Genoa. He recalled that his predecessor Benedict XV, who was from Genoa, was so devoted to the Virgin of the Guard that he had a statue of the Virgin placed in the Vatican gardens (see photo). "I myself", the pope said, "pray every day in front of that statue". Benedict XVI recalled the words of Mary in her apparition to a farmer, Benedetto Pareto, urging him to build the shrine without fearing the difficulties: "Trust in me! You will not be without the means to do so. With my help, everything will be easy for you. Only keep your will firm". The pope continued: "'Trust in me!' Mary repeats these words to us today. An ancient prayer, deeply rooted in the popular tradition, has us address to Her these trustful words, which today we make our own: 'Remember, O most gracious Virgin Mary, that never was it known that anyone who fled to your protection, implored your help, or sought your intercession, was left unaided'. It is with this certainty that we invoke the maternal assistance of the Virgin of the Guard over your diocesan community, over your pastors, consecrated persons, lay faithful: the young, the families, the elderly. We asked her to watch, in a special way, over the sick and all the suffering, and to make fruitful the missionary initiatives that are in preparation to bring to all the proclamation of the Gospel. Together we entrust to Mary the entire city, with its varied population, its cultural, social, and economic activities; the problems and challenges of our times, and the efforts of those who are working for the common good". Benedict XVI emphasised the universal vocation of the city: "Liguria, and in particular Genoa, has always been a land open to the Mediterranean and to the entire world: how many missionaries have gone out from this port for the Americas, and for other faraway lands! How many people have emigrated from here for other countries, perhaps poor in material resources, but rich in faith and human and spiritual values, which they then transplanted in the places of their arrival!". Before the Marian prayer, he invoked the protection of Mary "Star of the Sea" over the city and above all over the young people, "that they may follow, with her help, the correct route through the often stormy sea of life".